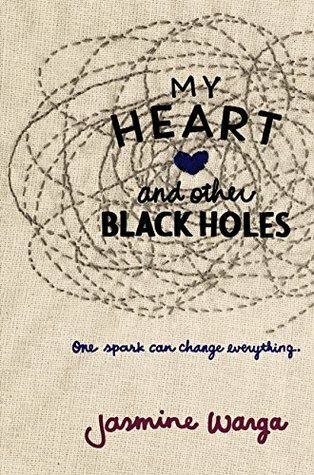 As a member of the Fearless Fiteeners, I was able to read an ARC of Jasmine Warga’s young adult novel, My Heart and Other Black Holes (2/10/2015; HarperCollins/Balzer+Bray). ARCs (Advanced Reader Copies) are the uncorrected proofs that are sent to reviewers, librarians, and book bloggers to promote the book. My fellow fifteeners and 2k15 classmates are sending their ARCs on tour, which allows us a sneak peek at these upcoming new releases. I’ve decided to let you all know about the ARCs I’m reading to help support my 2015 debut colleagues. Here’s the description: Sixteen-year-old physics nerd Aysel is obsessed with plotting her own death. With a mother who can barely look at her without wincing, classmates who whisper behind her back, and a father whose violent crime rocked her small town, Aysel is ready to turn her potential energy into nothingness. What I liked about it: This novel is both heartbreaking and hopeful. Jasmine Warga captures the weighted, dead-inside feeling of depression and, ultimately, the tiny fragments of hope that can help someone fight through the pain. Aysel’s transition from wanting to commit suicide to wanting to save both herself and Roman is slow and, therefore, realistic. Their relationship slowly reveals to her reasons to stay alive. That Roman does not follow suit is also realistic because he has his own demons to face and having people love you doesn’t make depression go away. This is an intimate, accurate depiction of depression, why some teens consider ending their lives, and what it takes to find hope again. About the author: Jasmine lives and writes in a small town that is a few miles outside of Cincinnati, Ohio. She likes: Animals (of all sorts! ), especially her cat, Salvador, and her puppy, Scout. Surrealist sketches. Iced coffee. The night sky. Old swing sets. Lemonade. Rainy mornings. She does not like talking about things she dislikes. For more information, check out her author website.